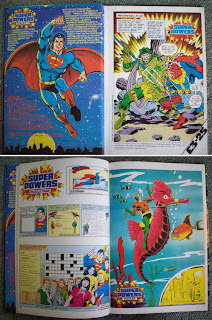 It's A Dan's World: SANTA'S WISH LIST: Bring Back The UK Comic Annuals. SANTA'S WISH LIST: Bring Back The UK Comic Annuals. Batman by Denny O'Neil and Neal Adams! Spider-Man by Stan Lee and Steve Ditko! In hindsight there's no wonder as a kid I looked forward to this time of year, when the oversized A4 UK Annuals would arrive in our stores. As a small town kid who needed something to survive on in between 'big city visits' these end of year collections were packed with 2-3 comics, posters, 'secret files', puzzles (which friends knew the consequences of actually filling out) and the ultimate parent-pleasing manoeuvre: actual type-based short stories! Choosing which one was a war in itself! While character Annuals focussed on adventures from that hero's history, theme Annuals like 'Super Powers' or 'Secret Wars' had an issue of the title comic, then strips introducing awesome concepts like Alpha Flight, that hadn't yet made it to the shelves of your local store. For me if I couldn't find a Justice League-ish book with the likes of Aquaman, Hawkman and The Flash all together, I generally grabbed Batman's first. The way Neal Adams drew The Dark Knight will always be the stuff of legends. Thankfully the solid hardcovers of my 'old faithfuls' has seen their art and contents last to this day! While it's been years since any new ones were released here, I always have one eye towards the local secondhand bookie or car-boot sale. They're great fun, so if you see one - grab it - you'll be glad you did! Those UK Annuals always looked so cool when you'd occasionally see an ad for one in an American comic. I see there's a big shot of Aquaman in there! Any other Aqua-related stuff? Same old story sorry Rob, Aquaman was sadly used as a third wheel, except in the reprinted League stories - that's part of why I used to hunt them so much. I lived in a beach town and swam in the ocean as often as I walked on land lol so Aquaman was a hit with me right from the start! Any readers who haven't checked out Rob's awesome blog(s) be sure to click on the links to both the Aquashrine and TreasuryComics on the right - They're some of the best comic blogs you will find!